The views from the ridge are reveal a forest dominated landscape under a blanket of cloud. Photo: Eleanor Briggs/WCS. I often feel like a kid in a candy store. As a biologist working in the most biologically diverse protected area in the world, sometimes I really do have to pinch myself. In a place as diverse as Madidi, I am privileged every day to see a life form I have not encountered before. Every day there is something new to behold, and every now and then these personal revelations are discoveries for the broader scientific community. Herminio Ticona and I search for amphibians in the hollows between bromeliad leaves. Photo: Eleanor Briggs/WCS. At the very first site of the Identidad Madidi expedition in May and June of 2015, a group of us visited montane forests and open peaks at around 2,400 meters above sea level. It was a day-trip and technically peripheral to the habitat focus of that first trek: the montane grasslands and associated gallery forests of the Apolo region of Madidi, so we only had a couple of hours to explore. 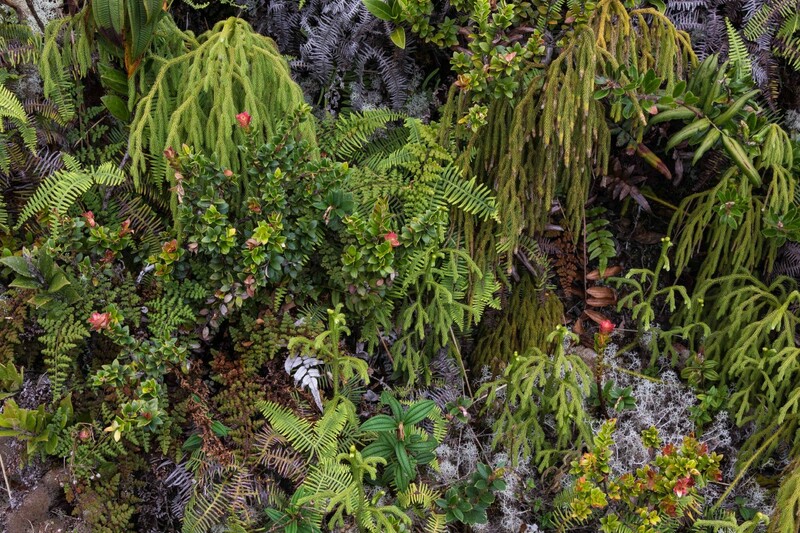 The forests were shrouded in cloud, providing a spellbinding atmosphere and reinforcing the term “cloud forest,” but then we reached the more open and humid peak with an intricate, multicolored and textured garden of shrubs, flowers, mosses, and lichens as beautiful as any forest canopy. The patterns, shapes, colors and textures of the shrub and ground layers atop the mountain ridges are delightful. Photo: Eleanor Briggs/WCS. As we desperately tried to photograph this miniature natural wonder, I noticed a number of large terrestrial Guzmania sp. 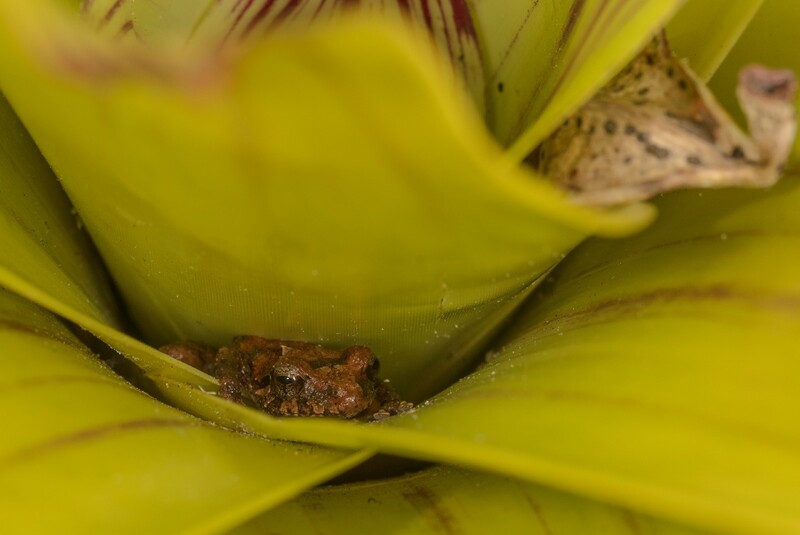 bromeliads (from the same plant family as the pineapple) and half jokingly/half seriously declared that the tiny wells at the base of their deep, broad fronds might be a good hiding place for a new species of frog. This prompted a frenzied but careful search of the 20 or so bromeliads nearest to us, and after a while one of us thought they saw, but failed to capture or photograph, a frog. But the afternoon was ebbing, and it was time to return to camp 700 meters below, and reluctantly we were left to dwell on what might have been. Freddy is working with David Villalba on Identidad Madidi, and together across 13 of the 15 sites they have added almost 400 species to the official plant list for Madidi. We fully expected to discover a few new species during the Identidad Madidi expedition. After all, we had previously been involved in the description of new species from the park. In 2005 the discovery of the Madidi titi monkey (Plecturocebus aureipalatii) raised $650,000 for a permanent trust fund for the park. The bizarre Tacana tree toad has especially adapted feet for climbing. Photo: Mauricio Ocampo/CBF. 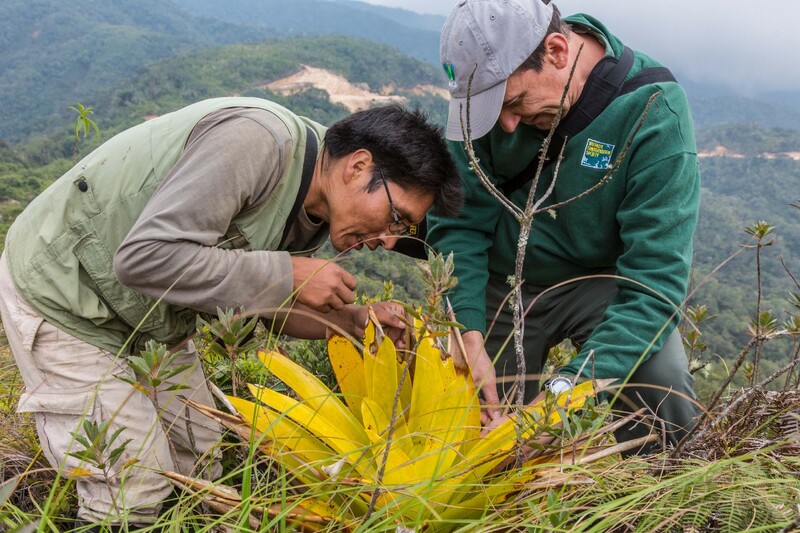 Also, to our great surprise, a decade ago when we began working with local communities on the sustainable use of incense in the cloud forests at around 2,000 meters above sea level, the plant from which the incense was derived ended up being a new species for science. This aromatic resin harvested for over a century for use in religious and spiritual ceremonies was named Clusia pachamamae by botanists Freddy Zenteno-Ruiz and Alfredo Fuentes. The notion that a new species can be concealed right under our noses spawned the phrase “Madidi is Madidi, where anything can happen. 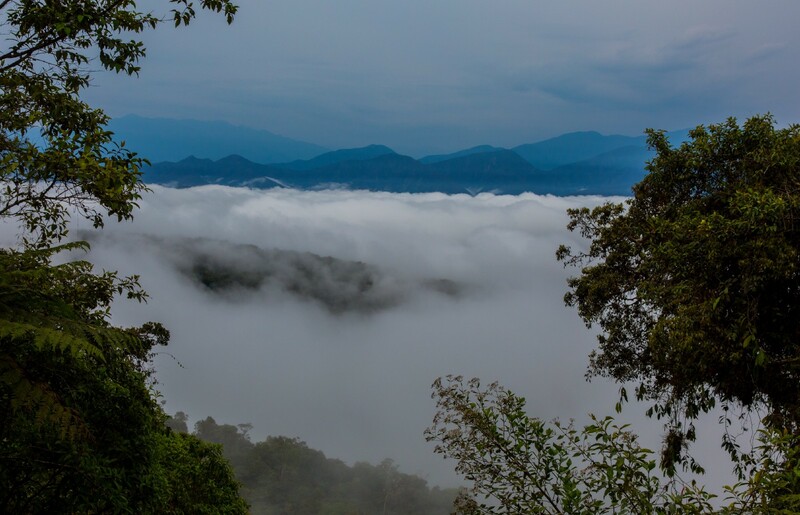 The montane forests of Madidi are known as cloud forests because a portion of most days of the year they are shrouded in mist, when they become singularly atmospheric. Photo: Rob Wallace/WCS. Freddy is working with David Villalba on Identidad Madidi, and together across 13 of the 15 sites they have added almost 400 species to the official plant list for Madidi, which is now fast approaching 5,500 confirmed species in one park (roughly the same number in the entire country of Canada!). Ten days in Sarayoj reveal three new birds for Madidi, increasing the confirmed list to 1,015 species, as well as an amphibian addition for the Identidad Madidi list: the incredible and arboreal Tacana tree toad. Amazingly, 74 of the new records are candidate new species for science, and Freddy will be spending a significant portion of 2018 working through the candidate new species for formal submission to taxonomic authorities. 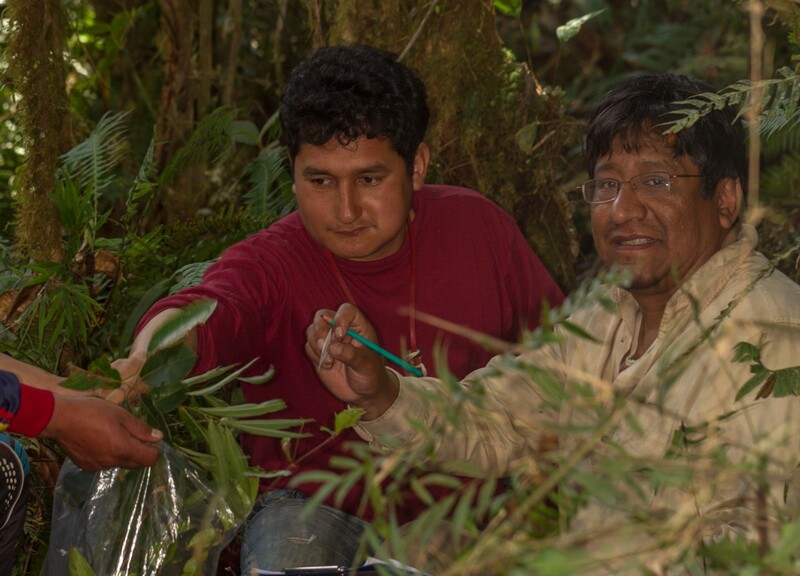 Freddy Zenteno and David Villalba from the National Herbarium of Bolivia are discovering many candidate new plant species in Madid. Photo: Omar Torrico/WCS. For vertebrates, after 13 sites we are up to a total of 32 candidates as new species, including five Microkayla High Andean frogs; three lizards from different genera; and 18 fish, among them several Astroblepus, Trichomycterus and Ceptosorhamdia catfish. However, describing new species is no walk in the park, and the team is only just beginning to formally submit manuscripts for review. Back to the expedition. It’s the dry season of September 2017 and the team is at the 13th of 15 study sites in Madidi: the Andean foothill and lower montane forests of Sarayoj. 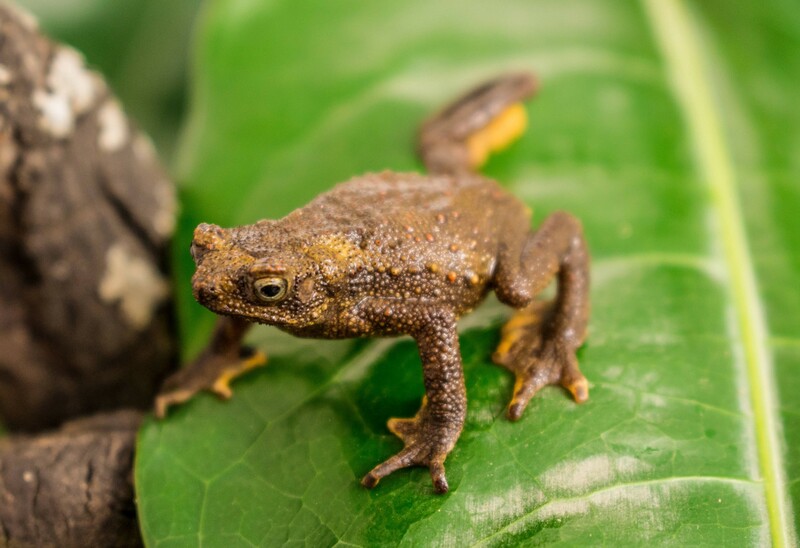 Ten days in Sarayoj reveal three new birds for Madidi, increasing the confirmed list to 1,015 species, as well as an amphibian addition for the Identidad Madidi list: the incredible and arboreal Tacana tree toad (Rhinella tacana). Mauricio Ocampo, a herpetologist from the National Natural History Museum, also finds a Dipsas snake and a Stenocercus lizard that now populate the list of candidate new species for science. To get to Sarayoj we pass right by the very same cloud forest peaks we encountered 27 months ago and an opportunity to revisit the bromeliads presents itself. 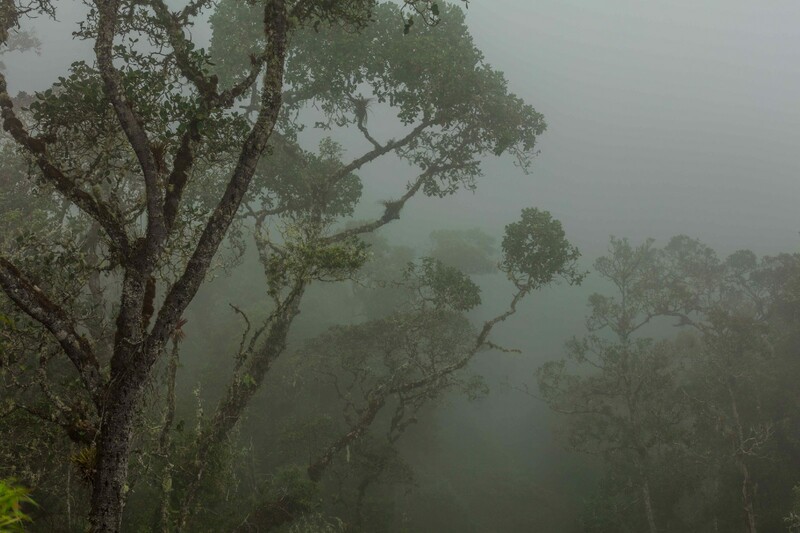 There are fewer of us, photographer Eleanor Briggs, Herminio Ticona, and myself, and we go through the same ritual, admiring the cloud forest, photographing the less humid miniature gardens, and searching for spectacled bear trails through the shrubs. From one of the hollows, an amphibian face peers back. Photo: Rob Wallace/WCS. Then, as we are about to turn back, I cannot resist inspecting a bromeliad. As I gently lift the first frond of the first plant I inspect and peer inside, a small anuran face is staring back at me. The Pristimantis frog genus is the largest vertebrate genus in the world with almost 500 species described to date. And of course, “Madidi is Madidi” and Mauricio and James Aparicio from the Bolivian Fauna Collection have confirmed that the unidentified Pristimantis frog is another candidate for a new species for science. You can follow our progress in more detail on our webpage, or on Facebook, where updates are most frequent. Originally published at voices.nationalgeographic.org on November 10, 2017.